There’s a buzz in the wet shaving community and it’s all because of Jenny Peck one of the owners of The Artisan Soap Shoppe. Last month when I was visiting Pastures in N.Y. and overheard conversations from a few visitors also included was the person who helps with the ordering of shaving products. They all talked about how great this new artisan is but I had no idea who they were talking about. Since that day I was able to do some investigative work to find out just who it was so I sent out a letter asking for samples and Jenny was gracious enough to send them to me. Her shaving soaps and after shave moisturizer is moving closer to the front of the pack. A family owned company with a passion for making handcrafted products from Shave Soap, Aftershave Moisturizers, Beard Care Products, and Coconut Milk Soap. Artic is the perfect blend Eucalyptus and Peppermint and the best part is it’s mentholated and if you like menthol you’re going to love this shaving soap. The scent is off the charts with peppermint upfront followed by the Eucalyptus. The Ingredients: Coconut Oil, Stearic Acid, Glycerin, Sodium Lactate, Fragrance. The bowl lather was not a problem although I did use too much water I was able to get it under control and create an abundance of lather that was rich and creamy. Once applied you'll start noticing the menthol kick and what a kick it is a fantastic feeling that lasts throughout the shave. The slickness and glide where outstanding allowing me to go over spots many times with no irritations. The post shave feel was also of the same caliber. What also helped in the great post shave feel was aftershave moisturizer really fantastic stuff. So, I had a great shave with Arctic and highly recommend them. Of all the scents I've tested the one people talk about the most was not included in my sample package which is Black Raspberry Vanilla. 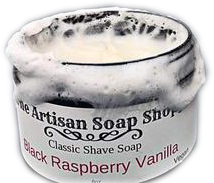 It’s described as vine ripe black raspberries blended with vanilla a tantalizing unisex fragrance. This was the one getting all the buzz at pastures.